Successfully Added 1/3 Inch Mini Wireless Camera with Receiver (USA) to your Shopping Cart. Our classic Mini Wireless Camera with Receiver set. This wireless surveillance camera and receiver kit is perfect for keeping your eyes and ears on your home or small business. Looking for an inconspicuous and economical way to watch over your room or small business? Look no further! This 1/3 Inch Mini Wireless Camera with Receiver is simple, affordable, and tiny! Hide it in the corner of a room and watch the action from a distance. Conceal it in your store and catch unsuspecting thieves in the act. Put it in your garage and see who's checking out your car. With a small, easy-to-install camera, a wireless receiver that can be placed 15 meters away, and the ability to link to a TV monitor, the uses of this Mini Wireless Camera are limited only by your imagination. The camera requires only a power source and can installed on walls, floors, or ceilings. 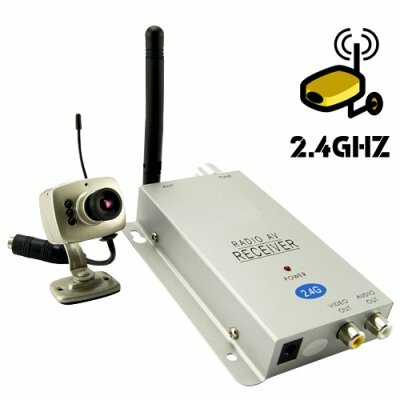 The wireless receiver can be positioned at a distance of up to 15 meters from the cameras and can connect to a TV through AV Out so you can monitor your cameras on a large screen. Good quality and an unbeatable factory direct price makes this 1/3 Inch Mini Wireless Camera with Receiver perfect for resellers. Order one as a sample, then buy in bulk to save more and sell in your store or online shop. Buy one today from the leader in wholesale electronics: Chinavasion. This surveillance camera uses the NTSC color system. It will work with any modern viewing and recording device that is NTSC/PAL compatible. If you need a PAL specific version then please order CVD-211A208C-PAL..
Is this model compatible with TV systems in Europe? This model is compatible with any modern TV and recording system that can switch between the NTSC/PAL color systems, which includes most security grade DVR's and monitors made in the last 10 years. Does this camera have a MIC (microphone)? Yes. Its effective range is to 1-2 meters. I FILL SAFE NOW WITH IT.